Home Zig zag Rat poisons Zig Zag Ratt Brodi Plus H.P. Bromadiolone-based bait in ready-for-use fresh paste. Use inside a safe container which can only be accessed by the targeted animal. Do not touch the bait with your bare hands, both for hygienic reasons and because rodents are suspicious of products touched by man. Poisoned bait in fresh paste, ready for domestic and civil use. 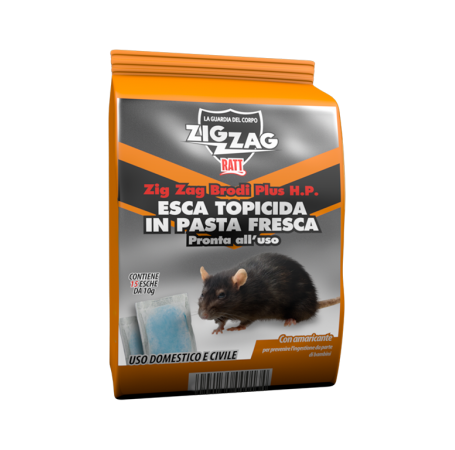 Fat bait with a composition specially designed to combat all types of rats and mice. Ingested once only, it can cause the death of the poisoned animal without painful agony.